Is Tubing or Hose Best for Your Pneumatics Application? /Is Tubing or Hose Best for Your Pneumatics Application? Chip McDaniel, Technical Marketing at AutomationDirect wrote an article titled Tubing versus Hose in Pneumatic Systems for the February 2018 issue of Fluid Power World. The article looked at some of the differences between tubing and hose, and related fittings—and at best practices for design, selection and implementation of each. Tubing and hose play a big part in the final connections to pneumatic devices on a machine, and sometimes between machines. Which one is used where affects what type of fittings are needed, and other pneumatic system components. Rigid pipes aren’t often used in pneumatic systems except in distribution manifolds and high-pressure applications. Flexible tubing and hose are used instead. Tubing is specified by outside diameter – for compatibility with push-to-connect fittings. Hose is specified by its inner diameter, and is typically sold with swivel, rigid, or quick-disconnect fittings attached at both ends. McDaniel points out several other characteristics of tubing. Typical tubing is an extrusion of polyurethane, nylon or a specialty material like PTFE. Tubing used in automation is typically less than 1” outside diameter (OD). Common tube OD ranges for main supply circuits is 1/4” to 1/2”. Pneumatic control circuits to cylinders and actuators often use smaller diameters in the range of 1/8” to 3/8” tube OD. Metric OD tubing is also available in a common range of 6 mm to 16 mm. Tubing is usually sold in rolls of 100 or 500 feet. It is good practice to use all English dimension or all metric dimension pneumatic tubing on a machine and in a plant. He also talked about coiled and bonded tubing, available in similar sizes, and related applications. Tubing is typically used with push-to-connect (PTC) fittings, which are specified based on the outside diameter of straight, coiled and bonded tubing. Hoses are different. Hoses are commonly used for manual operations and are often dragged across floors, they sometimes are manufactured with an integral nylon braid, to add strength. Some hoses are made with heavier rubber and some with lighter weight polyurethane, among other materials, but all are made to be flexible, strong and kink-resistant. This makes hose a good choice to connect shop air for manual operations such as pneumatic tools and blow guns. Some common hose inside diameters are 1/4”, 3/8” and 1/2”. Hoses use different fittings than tubes, typically NPT or quick disconnect types. The common tubing and hose materials listed in Table 1 were discussed by McDaniel in the article. Polyurethane is the most popular tubing material used in automated machines for many reasons, including its flexibility and strength. It works well with PTC fittings. Of the materials listed in Table 1, polyurethane and PVC tubing are the best choice for use in flexible applications. The durability and memory of polyurethane make it a good choice for self-storing, coiled and portable pneumatic hose applications. Although PVC is not as tough as polyurethane, it’s a good choice if low cost and high flexibility is required. PVC can also be specified in food-grade applications. Nylon and polyethylene are less flexible because they are harder plastics than polyurethane and PVC. These harder plastics are a good choice for air distribution and straight piping runs, and they work well with PTC fittings. They also have somewhat higher working pressures and temperatures. PTFE material has even higher temperature resistance and working pressures. It is also a flame retardant and chemically inert. Check out the article or AutomationDirect’s NITRA Flexible Pneumatic Tubing and Hoses for more details. There are lots of options out there. Fittings are used extensively to facilitate the connection of tubing and hose to the various components that make up a pneumatic system. A wide variety of fittings are available to meet application requirements as listed in Table 2. Push-to-connect fittings are one of the most popular methods to connect flexible pneumatic tubing used on industrial machinery. These fittings allow tubing to be easily connected by inserting it into the fitting. The tubing can be released from the fitting by depressing the circular ring on the fitting and pulling on the tube. PTC fittings come in many styles such as NPT, R-thread, G-thread, unions and stainless steel. The type of fitting selected depends on the threads found on the pneumatic devices, as well as the application requirements. McDaniel discussed the other common fitting types as well in the article, so check it out for additional details. Designing, specifying and installing tubing and fittings is often like putting together a puzzle and finding a piece is missing. Even after a second or third order is placed, pieces may still be missing to properly integrate the pneumatic system. Fortunately, pneumatic components are often low cost, so the leftover fittings, due to errors in ordering or purchase of a multipack, can often be put to use. It’s likely the next project will benefit from an inventory of fittings. The article contains many other suggestions to make pneumatic installations go smoother. Hose can be fixed with a repair kit and is usually disposable. Tubing cutters should be used to prevent crushing, and causing leaks at the PTC fitting. Check for a clean cut and remove dust and debris before inserting the tube. Also, relieve pressure before removing tubing from a fitting. 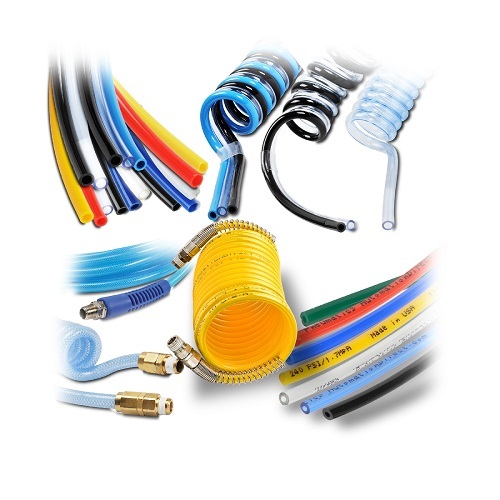 When it comes to tubing and hose selection, take the time to review the requirements of the application, and makes use of different materials and colors as necessary. Take advantage of the wide variety of fittings available to properly integrate the pneumatic system. 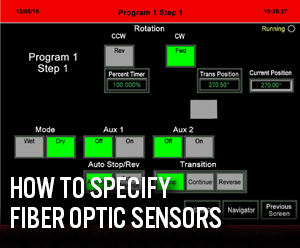 Following these guidelines will ensure your pneumatics installation works as designed. To read more articles about pneumatics, click here.